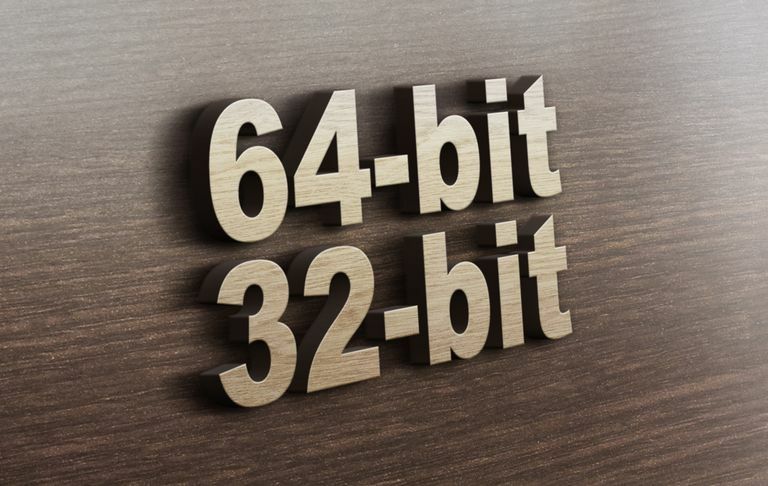 64-Bit & 32-Bit: What Do They Mean? Do the differences really matter? In the computer world, 32-bit and 64-bit refer to the type of central processing unit, operating system, driver, software program, etc. that utilizes that particular architecture. You've probably seen the option to download a piece of software as a 32-bit version or a 64-bit version. The difference does in fact matter because the two were programmed for separate systems. 32-bit hardware and software is often referred to as x86 or x86-32. 64-bit hardware and software is often referred to as x64 or x86-64. 32-bit systems utilize data in 32-bit pieces while 64-bit systems utilize data in 64-bit pieces. In general, the more data that can be processed at once, the faster the system can operate. There are several other advantages to a 64-bit system as well, most practically the ability to use significantly greater amounts of physical memory (more than the 4 GB allowed by a 32-bit machine). See what Microsoft has to say about the memory limits for different versions of Windows. Most new processors today are based on the 64-bit architecture and support 64-bit operating systems. These processors are also fully compatible with 32-bit operating systems. Most editions of Windows 10, Windows 8, Windows 7, and Windows Vista are available in 64-bit format. Of the editions of Windows XP, only Professional is available in 64-bit. All editions of Windows, from XP up to 10, are available in 32-bit. Every Mac operating system since v10.8 (Mountain Lion) has been 64-bit. Like Windows, Linux can be 32-bit or 64-bit. You can see which you're running with the lscpu command. Not Sure If the Copy of Windows on Your PC Is 32-bit or 64-bit? The quickest and easiest way to see if you're running a 32-bit or 64-bit version of Windows is to check what it says in Control Panel. Another simple method to finding out which OS architecture you're running in Windows is to check the Program Files folder. There's more information on that below. You might get a response like AMD64 to indicate that you have a x64 based system, or x86 for 32-bit. The best way to use one of these commands is to copy them here on this page and then right-click in the black space in Command Prompt, and paste the command. These commands only tell you the hardware architecture, not the kind of Windows version you're running. It's likely that they're the same since x86 systems can only install a 32-bit version of Windows, but it's not necessarily true since a 32-bit version of Windows can be installed on x64 systems, too. Knowing the difference is important so you can be sure to install the right kinds of software and device drivers. For example, when given the option between downloading a 32-bit or 64-bit version, a native 64-bit software program is the better choice. However, it won't run at all if you're on a 32-bit version of Windows. One of the only real, notable differences for you, the end user, is that it's possible that after downloading a large program, you'll find that you've wasted that time since it won't run on your specific computer. This is true if you've downloaded a 64-bit program that you expect to use on a 32-bit OS. However, some 32-bit programs can run just fine on a 64-bit system. In other words, 32-bit programs are compatible with 64-bit operating systems. That rule, however, isn't always true, and that's especially the case with some device drivers since hardware devices require the exact version to be installed in order for it to interface with the software (i.e. 64-bit drivers are needed for a 64-bit OS, and 32-bit drivers for a 32-bit OS). Another time when 32-bit and 64-bit differences come into play is when troubleshooting a software issue or looking through a program's installation directory. It's important to realize that 64-bit versions of Windows have two different install folders since they also contain a 32-bit directory. However, a 32-bit version of Windows only has one install folder. To make this a tad more confusing, the 64-bit version's Program Files folder is the same name as the 32-bit Program Files folder on a 32-bit version of Windows. One example for why this is the case is so that a 32-bit program doesn't try to use a 64-bit DLL, which won't work. Instead, when a 32-bit program is installed in the 32-bit Program Files folder, and then you run said program, Windows knows that it needs to pull up some 32-bit specific files instead of those used for 64-bit programs. 'Program Files' Folders on a 64-bit Windows 10 System. As you can tell, it's a little confusing to plainly say that the 64-bit Program Files folder is C:\Program Files\ since that's not true for a 32-bit OS. When Should You Choose Native 64-bit Software?